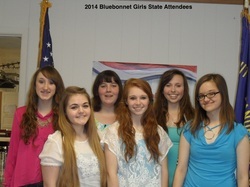 This photo is of the Bandera Independent School District (BISD) juniors selected to attend 2014 Bluebonnet Girls State. Girls State citizens are made up of excellent high school students from across the state. Girls are selected to participate based on nominations by their own high school faculty or staff. Eligibility is limited to any girl in her junior – or third – year of any Texas senior high school whether public, private or parochial. Fundamental qualifications of all nominees are demonstrated accomplishments of leadership, citizenship and character in their schools and community. Past Girls State citizens include former Governor Ann Richards, former Comptroller Carole Keeton Strayhorn, and Judge Court of Criminal Appeals Bea Ann Smith. Interested students and parents may contact the Bandera American Legion Auxiliary or the Bandera High School guidance counselor. This is a competitive selection and should be initiated in January. This state government education program is also conducted at a national level: Girls Nation. Girls Nation is held annually in Washington, D.C. Citizens of Texas Bluebonnet Girls State have the opportunity to select two citizens to represent Texas at the Girls Nation gathering. This is a wonderful opportunity for two outstanding citizens to attend a unique “hands on” Federal Government training session. Some of the greatest benefits of Texas Bluebonnet Girls State are those gifts that come from forming new, life-long friendships, learning about civic responsibility, performing community service and becoming empowered young women. The empowerment that citizens gain from Texas Bluebonnet Girls State comes through community, education and achieving goals through practicing our American Democratic process. Texas Bluebonnet Girls State is a mythical 51st state where, for one week, participants, or “citizens”, organize their own city, county, and state governments. They elect their own officials, learn the duties of the various city, county and state offices. Citizens introduce and debate their own bills in a mock legislature. The program concludes with a visit to the State Capitol building in Austin where the citizens are given an opportunity to sight-see and meet state officials. The Girl’s State schedule is active: throughout the day citizens will attend educational assemblies and lectures, they will have time to write bills, prepare debate, meet with their cities, and file for office, many days will end by electing officials. Citizens will also be present at flag raising and lowering. Upon their arrival at Girls State, citizens are divided into “cities”, “parties”, and legislative chambers. In their cities they elect officials such as a mayor, treasurer and city commissioners. Citizens also learn about government procedures on a county and then state level. The political “parties”, the National and the Federal, do not reflect the two major political parties in today’s system, but allow citizens to gain special knowledge and insight into how government works. Citizens are also placed into legislative chambers, the Senate and the House of Representatives, where they introduce, debate, and vote on bills. The session culminates in an election for governor during which campaigns are waged, speeches prepared and presented, ballots cast and votes counted. During the session, citizens will have the privilege of hearing many outstanding government speakers. Past speakers have included then Governor George W. Bush, former Presidents George Bush and Lyndon Baines Johnson, First Lady Mrs. Lyndon B. Johnson and Miss Barbara Jordan.